Author Visit Details | it's yaytime! -Prep. 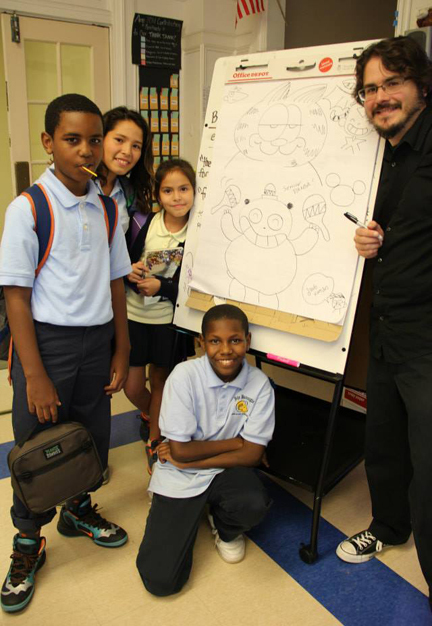 A little goes a long way toward helping make the author visit a success. Share the Intro to Dave. 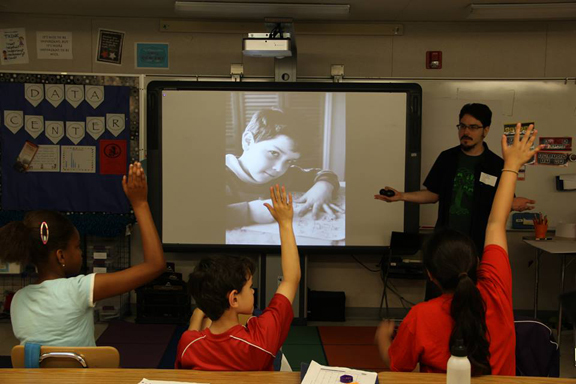 If you have any of his books in your school or classroom library let the kids know in advance of the visit. 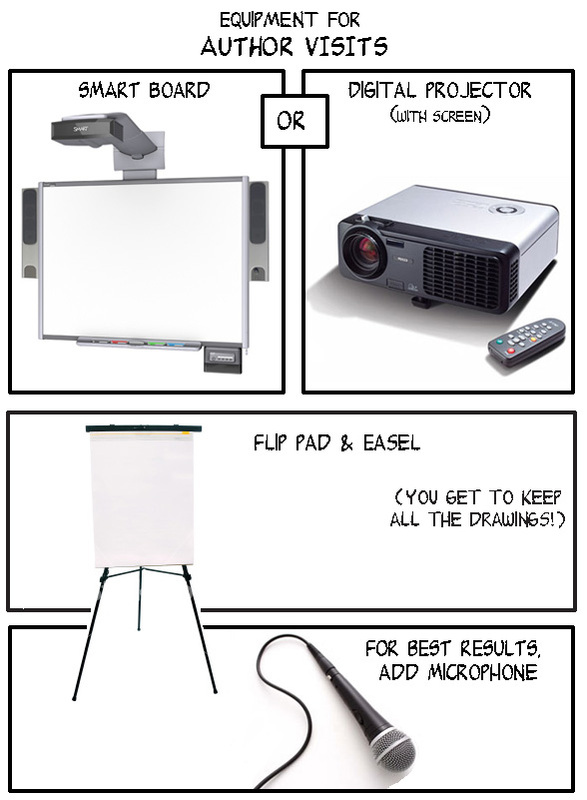 -Digital projector with VGA computer cables OR ability to connect to Smartboard and project a Powerpoint presentation. 1. You have your own laptop setup and Dave only needs to bring his presentation on a USB thumb drive. 2. Dave should bring his own Mac laptop with dongle converter. Dave generally brings his own USB clicker. But if you have your own, that’s cool too. -A microphone/amplification system is appreciated for any class larger than 25 students. Doctors orders! Especially if it’s in an auditorium, multi-purpose room, gym etc. Each 45-minute presentation includes slideshow visuals, live drawing demonstration, and time for Q&A. 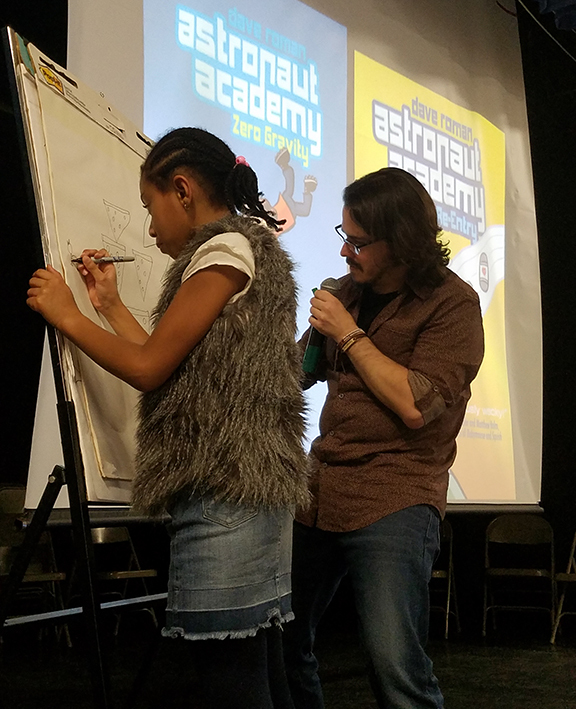 Dave Roman (Astronaut Academy, Goosebumps Graphix) will deliver a lively, visual discussion on comics, and how they’ve served as inspiration throughout his life, fostering a love for reading and a passion for making his own books. He will share insight into working at Nickelodeon Magazine, where he developed comics based on popular TV characters like SpongeBob Squarepants and Avatar: The Last Airbender. Using humor and personal anecdotes, Dave will discuss his writing process, drawing tools, techniques, and the life of a cartoonist. 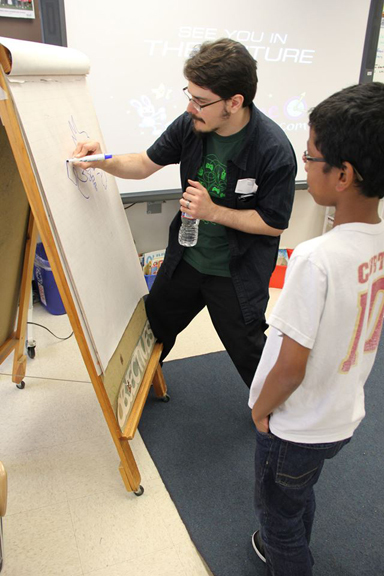 From brainstorming ideas, to writing and revising, art supplies and techniques, Dave invites people of all ages into the world of cartooning. Showing how he went from self–publishing black & white handmade minicomics to full–color graphic novels sold in bookstores, Dave will demystify the publishing process and inspire everyone to create their own visual stories! 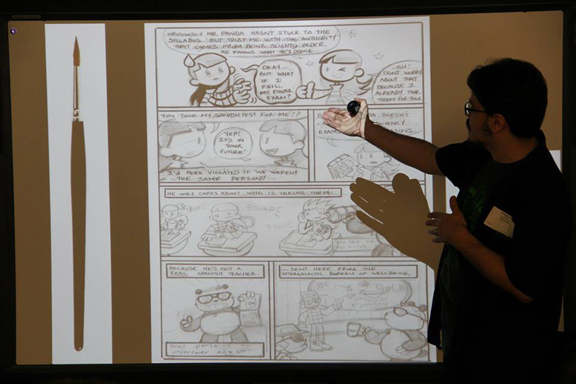 Dave uses visual examples to walk kids through the stages of making a graphic novel. Kids are encouraged to draw alongside him as equals! 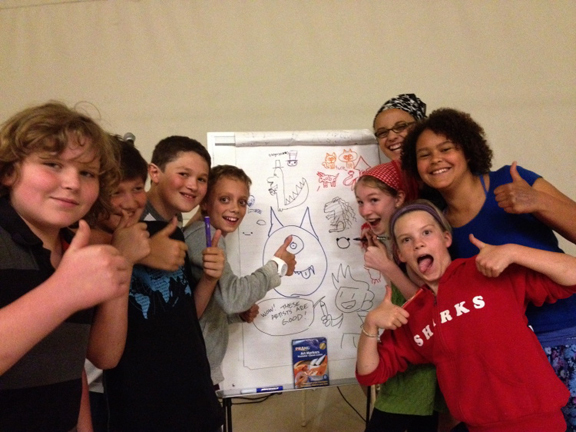 Even if kids don’t consider themselves artists, they can still have fun and be creative! 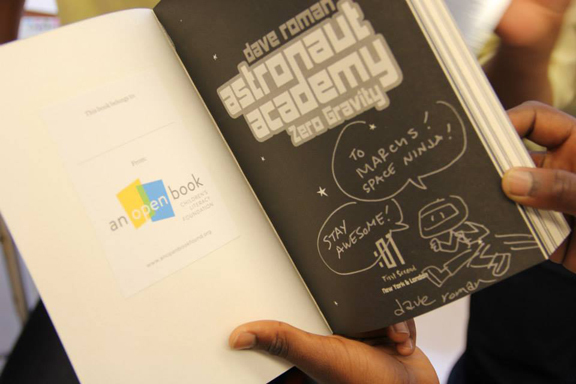 Dave will happily sign & sketch in all copies for the students. 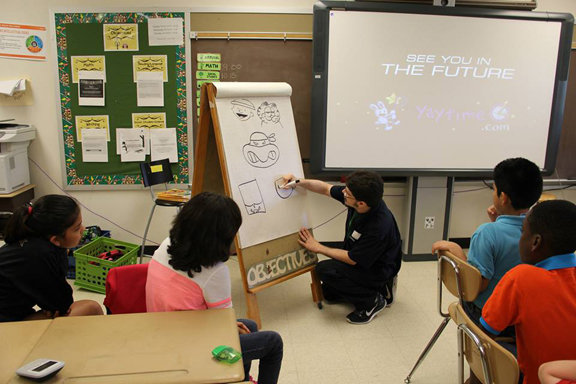 If there’s time, every kid will get a different character drawn in each of their books! 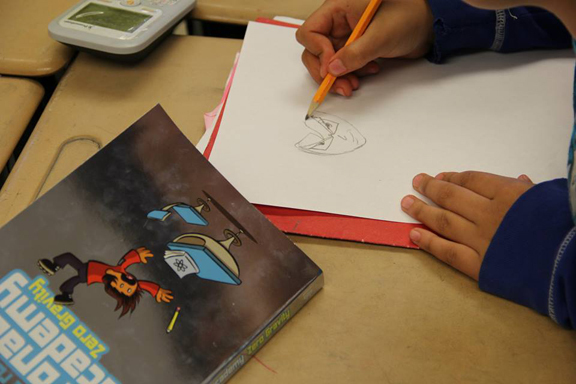 Many kids will be inspired to start writing and drawing their own graphic novels, knowing all it takes is a paper and pencil to get started! - Finding your passion! Being successful takes a lot of work, but it’s a lot less so if you are working at something you love. -Developing your voice! Each artist or writer has look within themselves and learn what separates them from the crowd. It’s not just about being the best. A true artist’s work has to be true to themselves if it’s to be seen as truly unique. -The power of collaboration! 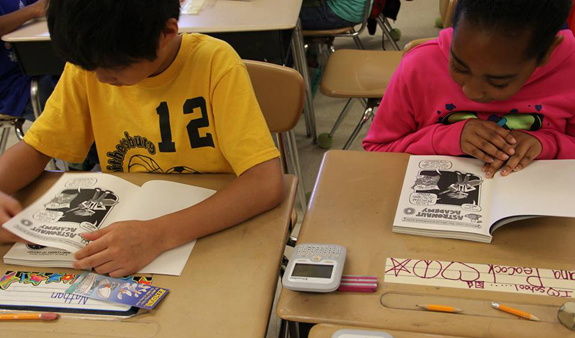 Combining words and pictures is at the heart of graphic novels. Many comics are created by writers and artists teaming up to produce something new, benefiting from the strengths of each. -Expanding our minds! Reading outside of your comfort zone and being prepared for the twists and turns down the road. -Supporting your friends and fellow artists! We’re all in this together! 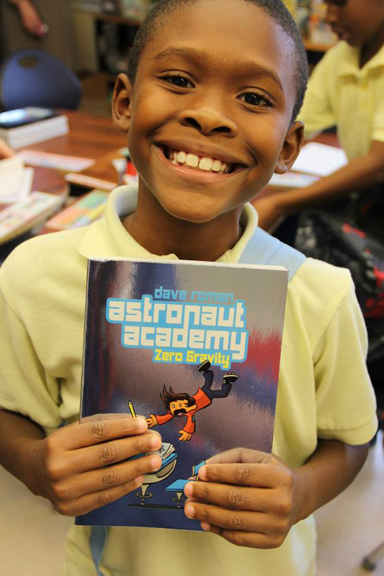 Even though his presentation will showcase Dave’s books, the more familiar kids are with the works in advance, the richer the overall experience will be. If your school library has copies of his graphic novels, be sure to display them before the author visit. Dave presenting at the Gaithersburg Book Festival. Dave’s books are available through most major book distributors and at special discount for author visits. To order books directly from the publisher, see info below. Have each ISBN and corresponding full book title, along with address (including zip code), date, name, and telephone number of the person placing the order. Make sure to mention that you are ordering books for an author visit. Astronaut Academy: Zero Gravity. Written and Illustrated by Dave Roman. Published by First Second books (a division of Macmillan). Astronaut Academy: Re-Entry. Written and Illustrated by Dave Roman. This is an anthology featuring a newly published story illustrated by Dave Roman. Teen Boat! Written by Dave Roman. Illustrated by John Green. Teen Boat! Race for Boatlantis. Written by Dave Roman. Illustrated by John Green. 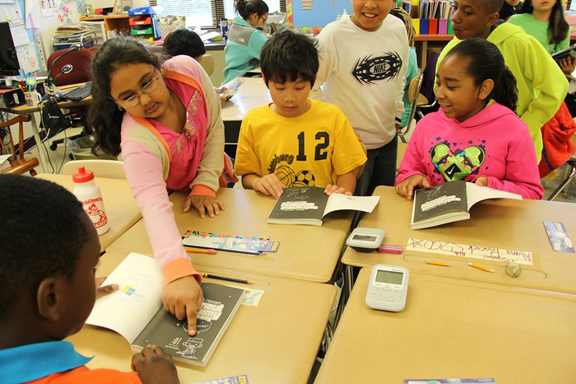 Thanks to Lucia Saperstein from An Open Book Literacy Foundation for taking some of the photos on this page! I would like to talk to someone about an author visit for our school’s summer library. Author visits coordinator Kate Kubert Puls is currently managing enquiries and proposals on my behalf. Please feel free to contact Kate at kubertpuls (at) gmail.com with any questions about my presentations.